Topics: Programming Tutorial, Beginners Tutorial, C# Structure, Hello World, Programming Tutorials, and Older Posts. 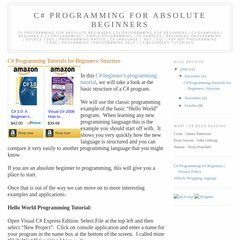 coderprogramming.blogs.. C# Programming for Absolute Beginners: C# Programming for .. It is hosted by American Registry For Internet Numbers (Virginia, Chantilly,) using GSE web server. Coderprogramming.blogspot.com's IP address is 74.125.67.132.